In a bowl, combine the flours and season with salt and pepper to taste. 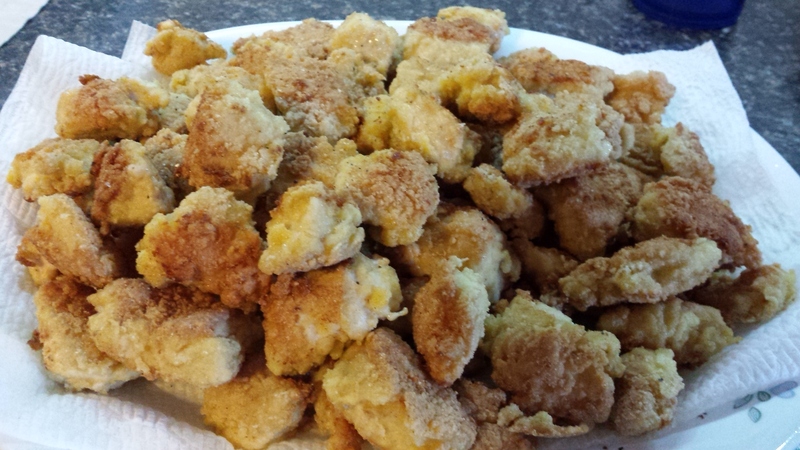 Dip each chicken cube in the beaten eggs; then coat with the flour mixture. Heat half or 1/4 cup of coconut oil in a large skillet placed over a medium heat. Cook the chicken until brown. Work in batches and do not over crowd your pan. You will have to add more coconut oil as you go. Takes about 10 minutes or until cooked through, turn so chicken is browned on all sides. So golden & delicious…I could not resist eating a few! Set the chicken aside and drain on paper towels. Add the bell pepper and onion, and cook for 2 minutes. Stir in the pineapple chunks, pineapple juice, apple cider vinegar, chicken stock, honey (if using), and salt and pepper to taste. Bring to a simmer and cook until the sauce thickens. Otherwise…Return the chicken to the skillet. Lightly mix to coat. Serve warm with green onions sprinkled on top. If you are NOT doing Paleo, you can serve over brown rice, or Orzo. *NOTE: You can use any combination of nut or seed flours (or grain flours if you are not Paleo and/or do not require gluten free). I like the subtle coconut taste.